A bright-eyed group of teens visited Signs by Crannie July 14 to learn about all the skills – and potential careers – that go into creating a commercial business sign. 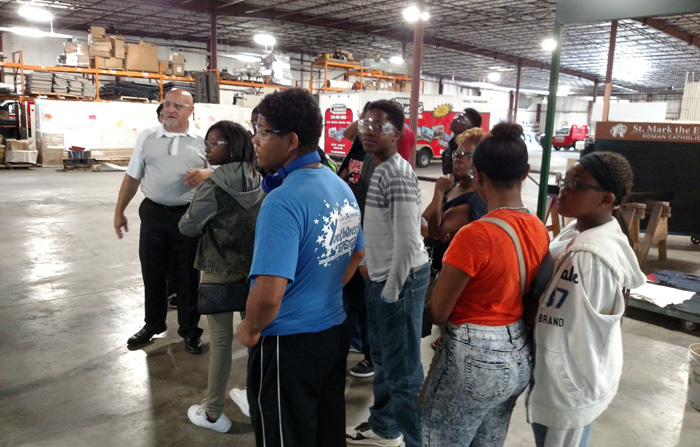 The manufacturing field trip was part of the YouthQuest program coordinated through the Flint & Genesee Chamber of Commerce. The goal of the trip was to show middle and high school students first-hand how careers in metal fabrication, electrical, and other skills can be obtained through certification programs, and what they might do in those careers. Dan Crannie, owner of Signs by Crannie in Flint, Michigan and Fort Myers, Florida lead the 24 students through the shop area in the new 60,000 sq.ft. Flint facility. They saw metal fabricators, welders, graphic artists, painters, and truck drivers each working on tasks as part of the sign making process. The students were surprised to learn that many of the signs they see every day in the Flint area were made in this factory. Several of the students questions revolved around the huge dollar figures involved in creating outdoor business signage. Dan explained that large investments in capital like a $250,000 truck-mounted crane are required to service his customers. This was why some of the signs cost tens of thousands of dollars. But students were the most attentive when Dan explained his background. Crannie said that his business hires electricians, welders and metal fabricators, commercial vehicle operators, and graphics designers. Each of these jobs are experiencing growth in the Flint area, and offer good pay. YouthQuest is a comprehensive, free after-school program that serves more than 2,000 K-12 students. It is administered by the Flint & Genesee Chamber of Commerce throughout the school year. YouthQuest offers high-quality activities and services that encourage the exploration of new interests in the areas of STEAM (science, technology, engineering, arts and math), and promotes academic achievement, physical fitness, youth leadership and volunteerism. In the summer, YouthQuest students participate in many of the same activities, including academics, recreation, field trips and sports.